L’Aeronautica militare nella Guerra di Liberazione 1943-1945. Cobelligeranza e Resistenza. Roma bombardata 1943-1945. Operazione CrossPoint. Brainchild of Prof. Lorenzo Lodi (1920-2008), the “Lorenzo Lodi” Library was inaugurated the 16th December 2011. Despite not insignificant financial and organisational difficulty, the library project had obtained the full support of the Roma Capitale ANCFARGL* circle. Subsequent to his demise, the 24th November 2008, it was unanimously decided to name the library after him. The focus of the Library is the period running from 1943-1945 and concentrates on the contribution of the Italian armed forces fighting alongside the Anglo-American Fifth and Eighth Armies. Over time and thanks to donations and acquisitions, the collection has expanded to include Italian Military Internees, The Italian Social Republic, the colonial wars (Libya, Eritrea, Ethiopia & Somalia), the wars of occupation (Greece, Albania & Russia), the Resistance in Rome, WWII, the “Julian March”, WWI, the Spanish Civil War, the Air Force, the Navy, Carabinieri, Police, Finance Police, Armoured vehicles, the Third Reich and Italian overseas missions. Sub-areas in the collection include twentieth century environment, territorial studies, geography, art and politics. The video and newspaper and periodical libraries are well stocked with period publications. The Library is entirely staffed by highly motivated volunteers. The Library mission is the conservation and study of sources and recollections pertaining to contemporary Italian history. 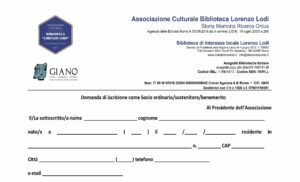 The Cultural Association seeks to promote reading, holds debates, conferences and exhibitions, runs a film club and makes research tools accessible, all as part of a programme of collaboration and co-operation with other Libraries and Institutes of Contemporary History in the city of Rome. The Library promotes access to its holdings via the publication of studies and catalogues, the preparation of bibliographies and specialist repertories and participation in integrated networks. The Library organises visits and holds remembrance ceremonies at Italian and overseas military cemeteries. Alongside the traditional lending Library, a virtual Library of contemporary History is being set up, featuring a selection of specialist web sites, free on-line electronic facilities and the digitisation of monographs and rare daily journals, enabling otherwise problematic consultation. Library personnel and structure: the Library is run by a librarian and two collaborators and is staffed for its day to day activity by final year students from Roma Tre, La Sapienza, LUMSA and LUISS Universities, participating in the Job Soul project for undergraduate internships. Association policy, planning and co-ordination are in the hands of the Scientific Committee, which is further responsible for managing the expansion of the Library. I decorati della Medaglia d'Oro catalogati in ordine alfabetico o per Regione di nascita. L’Aeronautica viene a conoscenza della resa solo la sera dell’8 settembre 1943.